April 9, 1959 signaled the beginning of a life altering adventure for seven brave women and the forty-one others who would ultimately follow them as their husbands became astronauts in America’s space program. This book tells the story of the exhilarating, frightening, rewarding and unexpected experiences these women encountered as astronaut wives. The original Mercury 7 wives forged the way for future wives, establishing models of behavior for the Gemini and Apollo women. Annie Glenn, René Carpenter, Trudy Cooper, Betty Grissom, Marge Slayton, Jo Schirra and Louise Shepherd and their husbands were the subjects of Life magazine articles in 1959 that provided the money the couples needed to supplement their modest military salaries. Life Magazine contracted with the astronauts and their wives to feature them in articles and then to follow them as they participated in the astronaut program in return for the money needed to finance the lifestyles their new celebrity status would create. As they watched their husbands undertake dangerous ventures into space, they faced each day followed by the press who reported their every move to millions of Americans and others around the world. Although they started out as naïve military wives, after years of glamorous parties, White House receptions, and the strength that comes from surviving the harshest of emotional situations, they emerged as sophisticated, resilient women. Since the astronaut program was housed in Houston the astronauts and their families lived in a Houston area the author refers to as "Togethersville." Some were next-door neighbors, others lived just a few miles away. In any event, they socialized and were at each other's back and call for support and camaraderie. 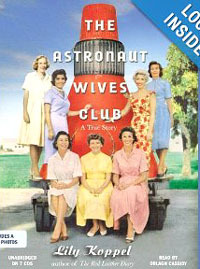 Marge Slayton organized a weekly coffee she called The Astronaut Wives Club. While the husbands maintained families in "Togethersville" they actually spent a great deal of time at Cape Canaveral in Florida. The scourge of the astronaut wives were the women they called "Cape Cuties" and more than one marriage was threatened by the lure of these other women. Lisa Koppell includes interviews with many of the wives who recount their astronaut days, but she also draws on news accounts and on the Life article to paint a picture of the wives and the time in which they lived. Annie Glenn was afflicted with a debilitating stutter, but that did not keep her from refusing to allow VP LBJ to enter her house after John Glenn’s launch was scrubbed. Her act of defiance was not typical of the astronaut wives who paid strict adherence to NASA’s stringent policies regarding behavior. The wives had to be model mothers and wives and many felt that any deviation would jeopardize her husband’s chance of securing a place on a future mission. One of NASA’s requirements was that the wife would rise predawn each morning and prepare a substantial breakfast for her astronaut husband so that he could fulfill his mission for the day. The women felt that their efforts were helping to fight the Red Menace, staving off communist aggression by helping the United States win the space race. Koppell’s book is fascinating with its exposé of the culture of the late 50s the 60s and the early 70s when the Apollo program ended. With its Mad Men vibe we are given glimpses of the 60s lifestyle of beehive hairstyles, cocktail parties featuring deviled eggs and designer gowns that the wives scored at consignment shops. Although they didn’t know it at the time these women were on the forefront of the feminist movement, because they were able to parlay the skills they acquired as complacent helpmates to transform themselves into outspoken confident women, and their media exposure allowed them to be role models for all American women. Entertaining as well as informative, this true story of America’s recent past is highly recommended.